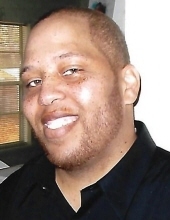 Celebrating the life of Charlie Clay Turner, Jr.
Obituary for Charlie Clay Turner, Jr.
Mr. Charlie Clay Turner, Jr., 34, of Little Rock, Ar departed this life on Wednesday, November 28, 2018. He was born on November 21, 1984 to the late Charlie Clay Turner, Sr. and Lorene Cummings Turner in Little Rock, AR. He is survived by two brothers, Claude Turner and Jackson Turner, both of Little Rock, AR and a host of nieces, nephews, aunts, uncles, other relatives and friends. Funeral services will be held 11:00 am, Tuesday, December 4, 2018 at Larry G. Acklin Funeral Home, 8821 Colonel Glenn, Little Rock, AR. Visitation 5:00 pm - 6:00 pm, Monday at the funeral home. To send flowers or a remembrance gift to the family of Charlie Clay Turner, Jr., please visit our Tribute Store. "Email Address" would like to share the life celebration of Charlie Clay Turner, Jr.. Click on the "link" to go to share a favorite memory or leave a condolence message for the family.